The Selby Gardens setting is a natural for Shakespeare's romantic comedy, filled with physicality. 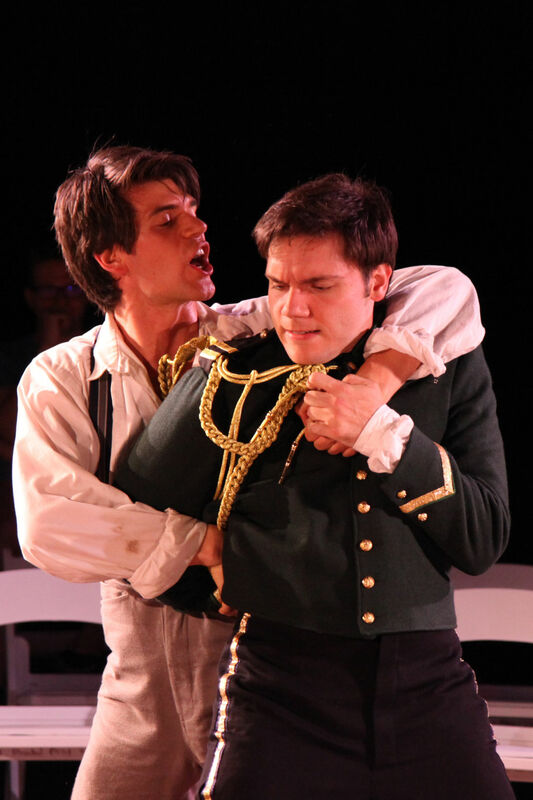 Michael Judah and Joe Ferrarelli in As You Like It. The pros and cons of doing theater in Selby Gardens are pretty obvious. On the one hand, you have a beautiful setting. On the other, you may have to contend with air and road traffic noise, biting insects and (perhaps more a hazard for the actors than the audience) being bathed in spit as the performers emote with energy. 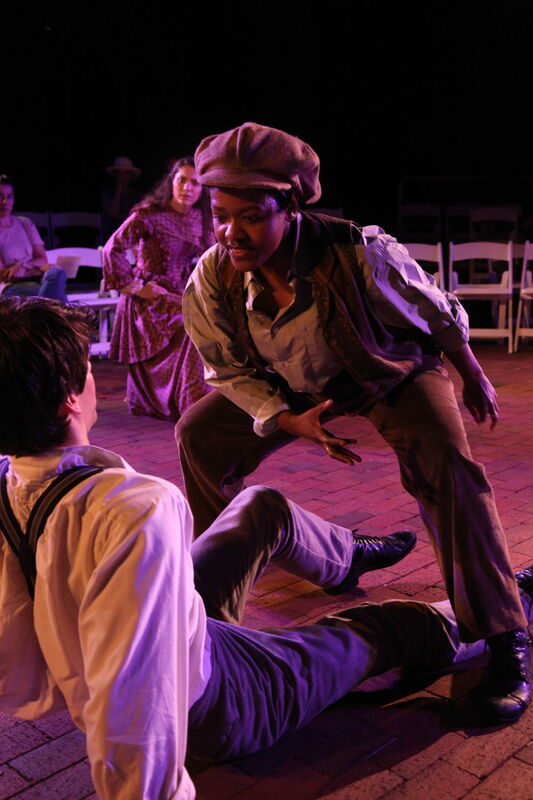 In the case of the FSU/Asolo Conservatory’s As You Like It, now running in its outdoor production at the gardens, the benefits outweigh the risks. 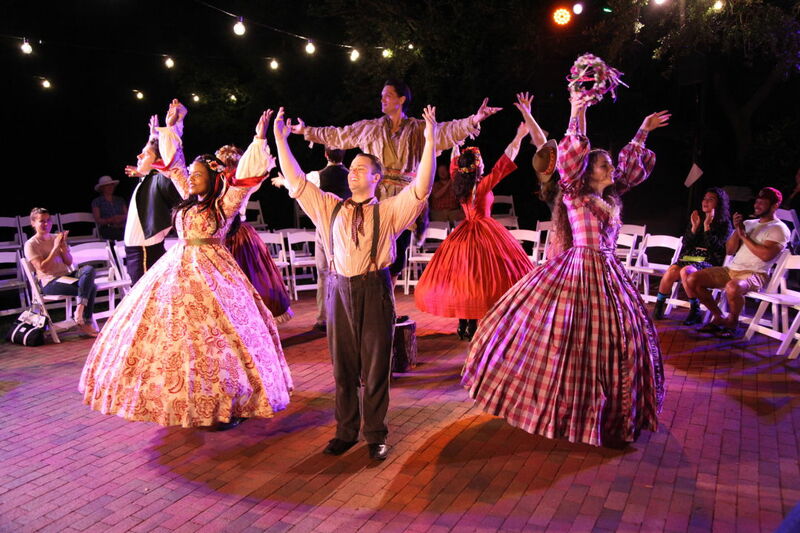 And As You Like It is certainly a natural choice for the outdoor show, since Shakespeare’s play is set mostly in the Forest of Arden, where a group of lovers and exiles come together. The trees, other vegetation and even the walkways place us squarely where we should be as we watch the comedic hijinks unfold. It’s physical from the first, under Jonathan Epstein’s sure direction, as Orlando (Michael Judah) is willing to take on two brother-wrestlers in throw-down action in order to prove something to his own brother, Oliver (Joe Ferrarelli). Oliver has taken an unreasoning dislike to his sib, one that’s echoed in the way the villainous Duke Frederick (Jonathan Grunert) has deposed his own bro (whom he also plays in later scenes). There’s not really any plausible motivation (just sibling rivalry?) for the enmity, but it provides the impetus for Frederick to exile his niece, Rosalind (Bonita Jackson). His own daughter, Celia (Jillian Cicalese), sharing a sister-like bond with Ros, insists on departing the court with her. So Rosalind dons male clothing and a streetwise air to become Ganymede, and the two, with clown Touchstone (Brian Ritchie), join what turns out to be a host of other characters in the forest. The nobility meeting up there intrudes a bit on the rustic countryfolk already inhabiting the woods, like the lovelorn Silvius (Mark Bitler), always importuning his resistant Phoebe (Carla Corvo) to marry him. And Touchstone may have to scare off the simple-minded Willem (Creg Sclavi, who also plays the melancholic courtier Jacques) to possess his ditzy, klutzy Audrey (Alex Pelletier). But all’s well that ends well, as Shakespeare reminds us in the title of another play, so the multiple improbabilities that lead to a happy conclusion are willingly overlooked. Sclavi as Jacques delivers a pleasing rendition of the play’s well-known “All the world’s a stage” speech, and Ritchie gets to tear up the place as the somewhat manic Touchstone. Cast members in the finale of As You Like It. It’s all accomplished with the barest minimum of set or props, a familiar (because of past Conservatory Shakespeare shows) mix of periods and styles in the costumes (by Sofia Gonzales) and some nice lighting effects by Chris McVicker. Oh, yes, and there’s music, too. Director Epstein lends his creative flair to getting the most gusto out of each scene, character and bit, and his cast responds by giving their best. As You Like It continues through April 27; for tickets call 351-8000 or go to asolorep.org/conservatory.